Denna produkt ger dig 3047 bonuspoäng. 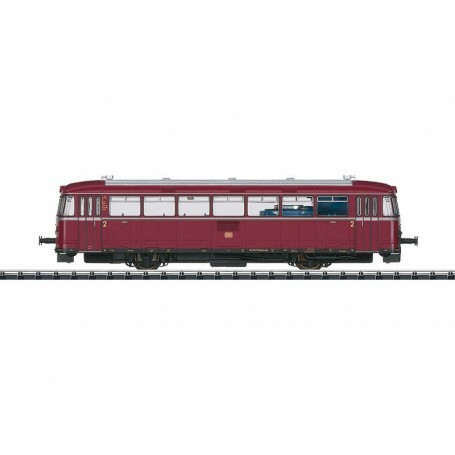 Rälsbuss klass VT 98 typ DB, digitaldekoder, ljudmodul, högeffektsdrivning, drivning på 2 axlar, innerbelysning, inredning, längd över buffertar 16 cm, epok III. Prototype: German Federal Railroad (DB) class VT 98 rail bus motor car. The car looks as it did around 1962. Model: The rail bus has a digital decoder with extensive sound functions. It also has controlled high-efficiency propulsion. 2 axles powered. The rail bus has factory-installed interior lighting. It also has interior details. Maintenance-free warm white LEDs are used for the headlights and interior lighting. The headlights and interior lighting will work in conventional operation and can be controlled digitally. Length over the buffers 16 cm / 6-1/4'. Highlights: Body constructed mostly of metal. Built-in interior lighting with warm white LEDs.